Whether you’d like to play on the field with Phillies Legends, support your spouse, friend, or parent, or manage a team alongside Phillies Legends, we’ve got you covered in three unique experiences you can try. Take the field in your own personalized Phillies uniform. Step up to bat at Citizens Bank Park and The Carpenter Complex, and compete against the Legends at Spectrum Field, the Phillies Spring Training ballpark. It's a once-in-a-lifetime opportunity to show your major league stuff to baseball legends. Did you ever dream of managing your own baseball team? 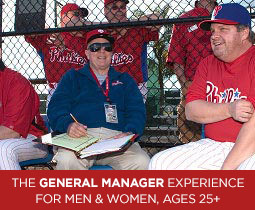 There’s no better place than alongside Phillies Legends with the General Manager Experience. You’ll experience professional scouting, a post-game interview, and much more. 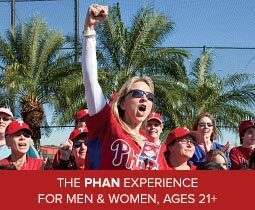 Bring along your spouse, significant other, agent, publicist, personal trainer, or anyone else in your “entourage” as a Phan. They’ll get to meet the Phillies Legends, attend evening events, get VIP seating at ballgames, as well as exclusive access to much, much more.